.At the heart of Barbados is the parish of St. George, with vast, flat plains suitable for growing sugarcane. Though it is landlocked, it has spectacular views of the southern and western coasts. St. George has several Anglican churches, including St. George's Parish Church, which is the oldest church on the island and filled with noted sculptures and paintings. Well worth visiting is Drax Hall Great House, once the home of Barbados wealthiest sugar planter and still in the possession of his family. 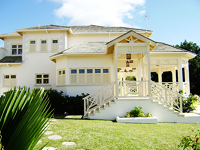 It is perhaps the most famous example of Jacobean architecture in Barbados, with its distinctive steep gables and decorative finials. Another large mansion in St. George is the Francia Plantation House, which has an impressive map collection. Just north of the church is Gun Hill Signal Station, one of six signal stations built in 1818 to alert the military of slave revolts and to sight ships approaching the island. Being the highest point in central Barbados, it has a great view of the acres of land beyond the parish. It is guarded by a 10-foot-high white stone lion, representing British rule, that was carved out of a single slab of limestone by an officer stationed there. One of St. George's attractions is Orchid World, which houses more than 30,000 orchids.